Let us return again to view rock art imagery. Anybody who has studied rock art forms like the upraised armed, bowlegged or drooping armed figure will have noted a pattern of recurring rock art symbols are found to be depicted grouped alongside or nearby them. One of those recurring images is that of a snake. At the moment current interpretation of the rock art scene above is framed in the ethnological context of ‘a shaman and his snake’. I believe now that I have identified the upraised, bowlegged figure form depicted here as instead the bare-line schematization of a large eruption spectacle we can now apply another more correct interpretation to the identity of the supposed ‘snake’ in these rock art depictions. Incoming large meteor fireballs leave a huge smoke trail in their wake as they plummet to the ground. Strong wind currents soon distort that smoke trail and it takes on the appearance of a weaving, ‘snake-like’ form in the sky. The ‘snake’ in these rock art depictions is not a real snake or the magical snake of a shaman but really represents the literal snake-like weaving smoke cloud left in the sky by a descending large meteor, asteroid. One must remember that some rock art was depicted after the event or recopied and the visual context of a ‘snake in the sky’ has lapsed over time and is sometimes depicted instead along the ground. 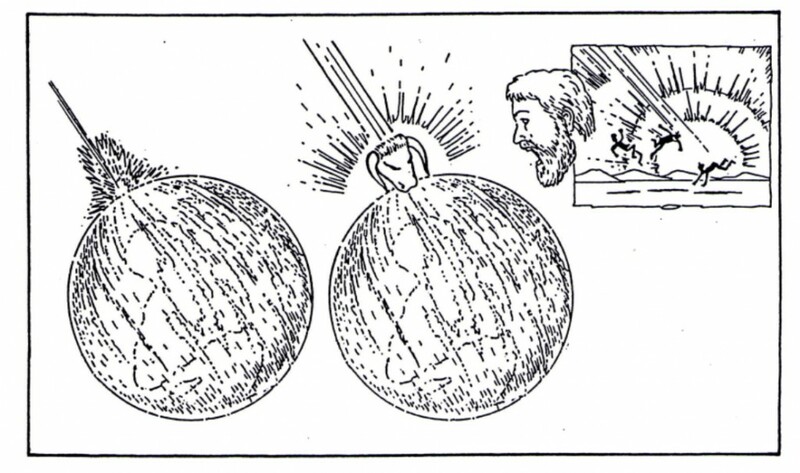 If the snake here represents the windblown, weaving smoke trail left by the falling asteroid/meteor then it makes contextual sense for the artist to depict it here alongside a figure form that is really a schematization of the ensuing large explosion and eruption sight caused from that falling meteor. Both the rock art figure form and the snake images are drawn closely together in relationship by ancient rock artists for they each visually corroborate the contextual impact relationship they share with each other. And just as the bow-legged, upraised armed and drooping armed rock art figure was visually assimilated into early religious iconography so too was the snake for the same reason it held huge impact significance to the ancients. Many written creation legends have a snake or serpent in their stories and in cases the snake, serpent is associated with chaos, an attribute that makes contextual sense as chaos would reign after the strike of a large asteroid and that the weaving, windblown snake-like smoke trail would be witnessed by the ancients hovering ominously in the sky over the chaos created below by such a large asteroid strike. 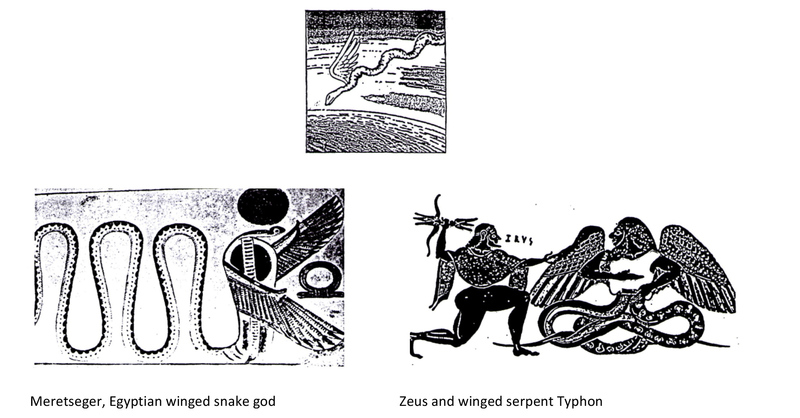 The smoke trail snake, serpent then is usually featured in religious and mythological depiction with up-raised armed deities which as reiterated are deity images which are themselves artistic projections over the schematised outline mushroom cloud shape from the impact, eruption sight and so rightly belong in visual context with each other. A large asteroid-meteor impacting onto the earth would create an immense earthshock, something the ancients most certainly experienced. Because the ancients were unable to comprehend and recognise what the earthshock really represented, to visually encapsulate that earthquake they chose to use images of horned animals in their religious iconography as animal ‘butting’ metaphors to visually express the notion that something like a ‘giant bull had severely butted the earth’. Such an awesome display of earth-shaking power caused the ancients to align many deities with bulls in commemoration of the impact event. 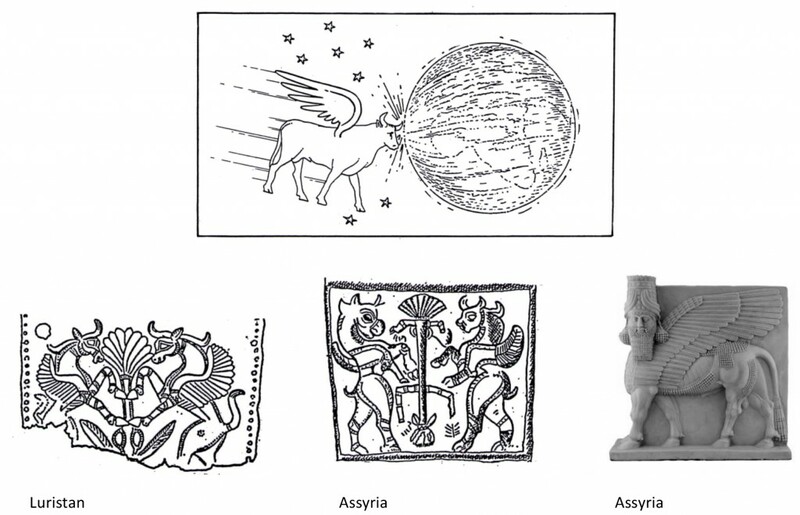 Enlil, a Sumerian creator god was aligned with the ‘Bull of Heaven’. The bull God Nandi was the mount of Indian creator god Shiva. The bull god Apis was associated with Egyptian creator gods Ptah, Osiris and Atum-Ra. Greek Zeus had a persona of a Bull. 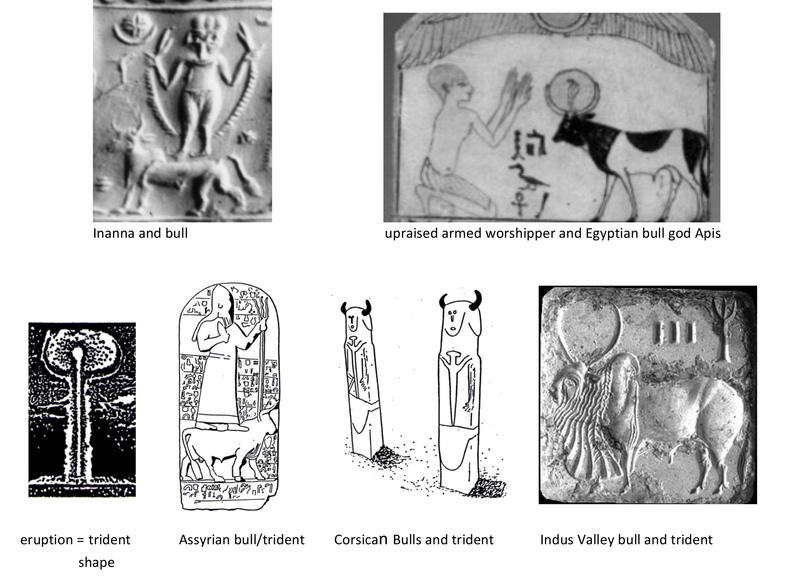 As shown the God Baal-Hadad was portrayed as a bull and his father El the chief Semite God was a bull god. The Chief Babylonian god Marduk was called the ‘bull calf of the Sun’. The Re’em or ancient aurochs bull was worshipped in Israel. The Chief Hittite God Teshub was associated with a bull. The Minoans on Crete worshipped bulls. We find aurochs and brahma bull imagery and worship in the Indus Valley civilization. Many Germanic tribes wore horned headdresses. Human kings were aligned with bulls. For gods and kings to be aligned with a bull was to be aligned with the awesome earthshaking power felt at the asteroid impact event. The rock art bull image was, like the rock art snake/serpent image, assimilated into early religious iconography and like the snake, serpent examples shown bull imagery was also associated with deities with upraised armed stances or trident images both of which were schematised images of the mushroom cloud eruption spectacle. 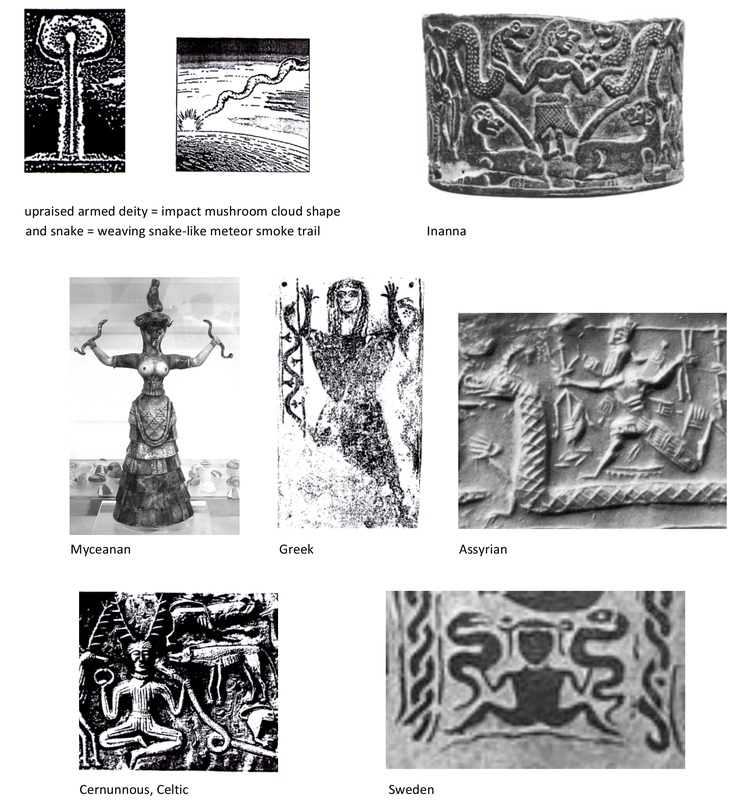 Perhaps the most tell-tale clue that bulls the ancients worshipped were animal imagery metaphors to convey the notion that the incoming asteroid had ‘butted’ the earth are the images of bulls with wings in religious iconography. Obviously ‘normal’ bulls don’t have wings. Wings were added to bulls to indicate to the viewer that the ‘bull’ (really the asteroid) had ‘flown down’ from the sky and butted (impacted) the earth. 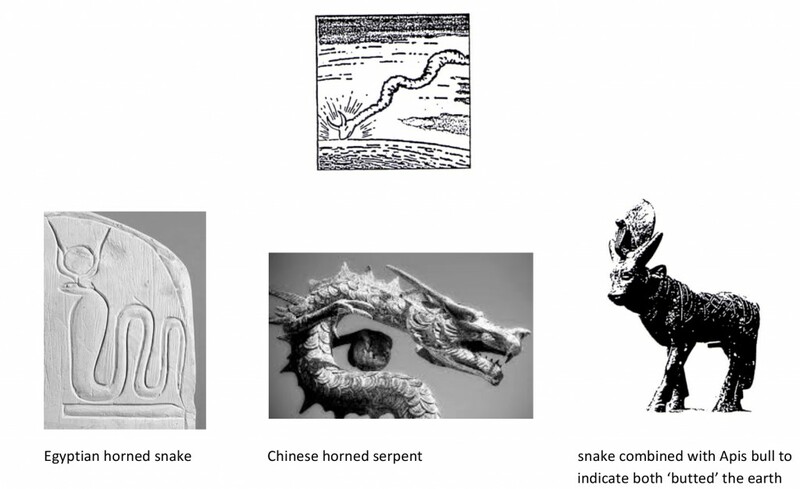 The idea that the earth had been severely ‘butted’ by the asteroid was not a notion solely reserved to the likes of bulls but also crossed over to the serpent snake image. As explained the weaving smoke trail left by the asteroid fall resembled a huge snake, serpent in the sky. Because the ancients had witnessed the snake-like smoke trail of the asteroid drop down to the ground they depicted snakes with wings to indicate the ‘flight of the smoke trail (snake)down through the sky’. Because they then experienced an almighty earthshock as the asteroid hit the earth they conceived the notion that the snake, serpent (really asteroid smoke trail) that had ‘flown down through the sky’ must have then ‘butted the planet’ and so they duly also placed horns on the heads of snakes, serpents in their religious iconography to indicate that particular impact interpretation.